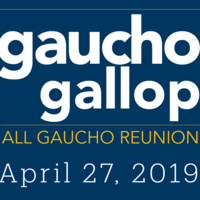 Come out for the 12th Annual Gaucho Gallop at 2019 All Gaucho Reunion. ONLINE REGISTRATION CLOSES WEDNESDAY EVENING, APRIL 24TH. Be sure to register online to secure the best race prices! Procrastinators will still be able to register on Friday's Packet Pick Up and the day of the event ($5 additional per person). To view the 5K course, click here. Participants will be able to pick up their bibs, t-shirts, and goodie bags on Friday, April 26th, 2018 at the Mosher Alumni House on campus from 12 pm - 6 pm. We will also have a small window for packet pick-ups on race day at if you are unable to make it. Registration will be available ($5 additional per person).